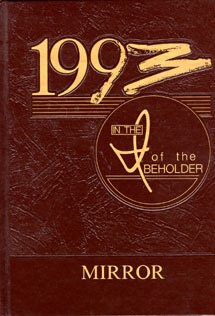 Now everything you wanted to know about the IHS Class of 1993 is at your fingertips....as published in the 1993 Mirror Class History. Are there any plans for a 25th reunion this year? "Just dropping by to say hi, hope all is well with everybody, and if anyone is in the New York City, I am there everyday drop me a line, I work in Union Square making Sky Scrapers....well drawing them at least... you can reach me at brownrig@optonline.net 24/7...love technology...and for the love of god can someone else post a comment so I am not the only one I think the last one is from 2005...."
"My wife Nicole (Tanner) and I welcomed our baby girl Marisol Annette on February 4th. Our little princess weighted 7lbs,14oz and was 19 inches long. We are still living in the Albany area and both working in the healthcare industry." "I am sure half of you if not all of you know that I got divorced in October 2007. I still reside in Colorado Springs, CO and I love it here. I met a great guy and we have been together over a year now and things are going great. I would love to hear from old classmates to see how they are doing. Keep in touch." "On March 7, 2008 I had a healthy baby boy named David Richard. He weighed 6 pounds 3 ounces and was 19 inches long. It is great to be a new mother. He joins his canine brother Ripken at home. I hope everyone is doing well!" "Jamey (also 93) and I moved back to Ilion in 2005, and are enjoying the slower pace of the small town life! Jamey is a Pharmaceutical Sales rep, and I am still working as an Environmental Engineer for the same chemical manufacturing plant outside of Albany, though only part-time from home these days. We have two little boys, Sam and Tommy, expecting our third child in March 2008. We share the neighborhood with other 93 classmates and are enjoying watching all of our kids grow up together! Take care..."
"What's going on everyone? Stumbled on this site. This is hilarious. I movedto Charlotte about 6 years ago. I got sick of shoveling snow so I packed the car and left. I currently work for Johnson and Johnson (yes the band aid people) coordinatingsurgeries for the company's orthopedic division. We cover virtually every hospital inNorth and South Carolina. I was promoted to operations manager last year. I'll beheading to Jamaica in December to get married. Congratulations to you all on,careers, marriages and your children." "Mike and I welcomed our first child on November 10, 2005, Sophia Rose Pavia. She is so beautiful and has so much hair. She is only 7 months old and has had 3 haircuts already! I love being a mom! I work at JFK Medical Center in the Cardiac Rehabilitation Department. I still visit my family and friends in Ilion every year. Looking forward to the next reunion. Take Care!" "I am currently an Assistant Principal at Jack Britt High School in Fayetteville, NC". "On Sept. 5, 2005 my husband and I welcomed our beautiful daughter into the world. Alexis Katherine Deon was born,two weeks early, at 9:19pm and weighed 6lbs. 11 1/4 oz. and was 19 1/2 inches long. She's an adorable addition to our combined family!" "Hello everyone, it's been a long time. I'm still around here, working at Rite Aid Pharmacy as an Assistant Manager, enjoying life." "My fiance, Matt Pfleegor, and I will be getting married July 19th of this year! And Emily Krenichyn will be a bridesmaid! :)"
"Just found the web-site and would like to say Hello to everyone." "Jamey Jacquays (also '93) and I got engaged on April 20, 2002, planning a Spring 2003 wedding. Jamey and I have recently relocated to Albany from Raleigh, North Carolina, where I lived for the past 6 years, and Jamey for the past 2. I am an environmental engineer working as a consultant, and Jamey is an Account Manager for Xerox." "I'm still single, living in the Bahamas for the past 3 years as a Director of a Christian camp. Livin' Bahamian, but always a New Yorker!" "Hey everyone! Things are going great in the valley. I am currently teaching sixth grade at West Canada. I am dating a wonderful guy from Herkimer and coincidentally, his name is ....Paul. Hey, at least I've had a lot of practice and can get the name straight!!!! I hope everyone is doing well and I love to get e-mail, so drop me a line. Only two more years until the reunion. Take care!!!!" "Hello! I've had a pretty exciting year so I thought I'd update. First of all, I'm FINALLY not a student anymore! Never thought I'd see the day. I received my masters from Elmira College this June and I'm finally a real live art teacher! My boyfriend and I just bought a house in Corning (something else I thought I'd never live to see the day!) and really love our new little home and the area as well. And to top it all off, I just got my first job in my profession as the (one and only) High School Art Teacher in Hammondsport. I guess life couldn't be better, really. I hope everyone is in equally good spirits and I'd love to hear from anyone and everyone! Take care!" "Just an update from the last time we talked. Still doing fine and am still with the Turning Stone Casino as the Asst. Entertainment Director. Working tons of hours but enjoying every minute of it. In the past year have gone to work with lots of entertainers such as:Carrot Top, Tom Jones, Styx, REO Speedwagon, Kenny Chesney, Chely Wright, Forigner, Sinbad, Howie Mandell, Smothers Brothers, Engelbert Humperdinck, George Carlin, Vertical Horizon, and many, many, more. If anyone is in town and wants to hang, give me a buzz. I'm alway's at work but can be paged by calling the casino operator and asking for me, or by calling my parent's house. Take Care and hope all is well, Adam P.S. If you see ashow you would like to see at the casino call me!!!" "Hi everyone! Just an udate from when I last wrote. Really not much to say. I am currently attending Oneonta AGAIN. I am going back for my masters in school counseling and so far it is going well! I still work at a daycare center in Utica and can not wait to finish school to get a real job. That is really all that there is right now, everything else is same old, same old. For those of you who left the area, lucky you. Nothing changes around here!!" "Hello everyone! !--I'm currently living in the Washington DC area working at Sprint PCS as a finance analyst. Gina Tyner (class of 1994) and I recently celebrated the birth of our son Daniel James Brewer on February 6th 1998. I'm also very active the DC area music scene as the owner of Outer Loop Records, an independent record label that represents various musicians throughout the region--Drop me line!!! "I'm still living in Ilion and working at Junior Junction Day Care Center in Utica. I'm planning on returning to school in the Fall to major in child psychology." "Glad to see that Ilion has made it onto the information superhighway." "Glad to see Ilion High School is staying in the fast lane of the information highway. I hope more members of the Class of 1993 will come on-line. Also, you may want to add WKTV's web site to your list of links. We are also putting past local news stories on the internet as well as publishing a daily news page. Our address is www.wktv.com. I'd like to wish everyone a Merry Christmas and a Happy New Year! Keep in touch!!!!" Ashley Hendrik, from Niagara Falls, dropped by the GuestBook with this update. "Hey everybody....This is a really cool web site. Just got back from a 2 month trip to Switzerland to study and travel, and leavingsoon for Bejing, China, then back to Europe. Lots of things to do and so little time. I'm sure everyone knows that by now. Good luck to everyone in all you do.. Send Mario Rivero, email, all your class news.